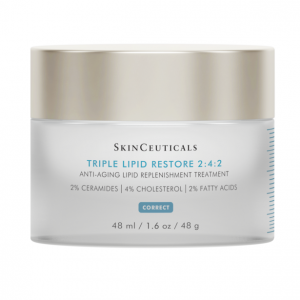 SkinCeuticals has unveiled the latest to their “Correct” portfolio – Triple Lipid Restore 2:4:2 – a unique anti-aging lipid replenishment cream. . . Cream: Triple Lipid Restore 2:4:2 is the first product to effectively harness the power of potent lipid combinations, with a 4% cholesterol-dominant ratio – specifically for aging skin – alongside a 2% concentration of both ceramides and fatty acids. Delivered in a lightweight and fast-absorbing texture, this supple cream is proven to stimulate lipid replenishment, barrier protection, hydration and repair in aging or dry skin.